The construction of timber, from its early growth.. Essays in natural history and philosophy..
An history of animals, containing descriptions of the birds, beasts, fishes and insects of the several parts of the world..
Spatogenesia. 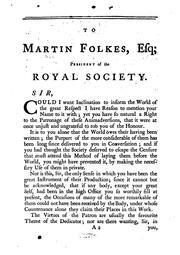 The origin and nature of Spar..
A Review of the Works of the Royal Society of London: Containing Animadversions on Such of the ..
Are you sure you want to remove John Hill from your list?